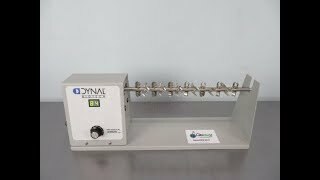 The Dynal Biotech Rotary Shaker provides efficient and reliable rotisserie style mixing in an easy to use instrument. This lab rotator works with test tubes, turning end over end with adjustable speed control and a digital read out for repeatable results. The Dynal Biotech Rotary Shaker is small enough to fit where you need it most nearby on a lab bench, or in a cold room. This rotisserie style mixer is an ideal choice for mixing blood, preparing homogeneous dispersions of particulates, dialysis under agitation, liquid-liquid extractions and mixing of particulate-liquid applications. This DYNAL Biotech Tube Revolver Rotator CAT# 10102 has been fully inspected and is ready for shipping. All of our lab equipment comes backed with our standard warranty. Should you have any questions about this of any of our other rotators, please don't hesitate to contact us.